Thank You for allowing us the awesome privilege and entrusting to us the enormous responsibility of standing in the gap for the Nation, the city, the church, and our homes. Receive the sweet incense of our praises day and night all over our area. "Listen! The Lord is calling to the city, and to fear Your name is wisdom" (Mic. 6:9). Let our obedience to Your voice be instant, complete, and joyful, just because You are Lord and we submit to You above all else. Search us, bend us, melt us, break us. We crucify cost, comfort, reputation, convenience, and business as usual not to miss the day of visitation of the Lord. You are moving, let us not miss You. Raise up men and women of Issachar, who know their God, know the times, and know what Your people are to do (1 Chron. 12:32). Give us men, women and children, a Josiah generation, who seek the mind and heart of God to pray the prayers of Your heart. Let us pray with You, not just to You, Thy Kingdom come, Thy will be done prayers. and reveal His holy arm, to redeem and show His salvation and His glory in the sight of all nations. ...and muster for spiritual revolution in these troubled times, knowing how to keep rank under the Captain of the Lord's host, until His final battle plans be accomplished. Let these prayers this day be tantamount to the trumpet call to which Nehemiah referred when he said, "The work is extensive and spread out. Whenever you hear the sound of the trumpet, join us there. Our God will fight for us. Remember the Lord who is great and awesome" (Neh. 4:17, 20). We as watchmen corporately lift the trump of our voices to call forth the spirit of repentance, prayer, and praise that will shift the balance of power in the heavenlies, so that You can rend the heavens and come down in an unprecedented way to make this a city of jubilee, of spiritual refuge, and new life. We need more intercessors to join us to pray for Britain at this crucial time in its history. Please send this post to all those you know who will answer the call. Feel free to share this post on Facebook, Twitter, Linkedin etc. Prayers are sent out via Whatsapp or Email. 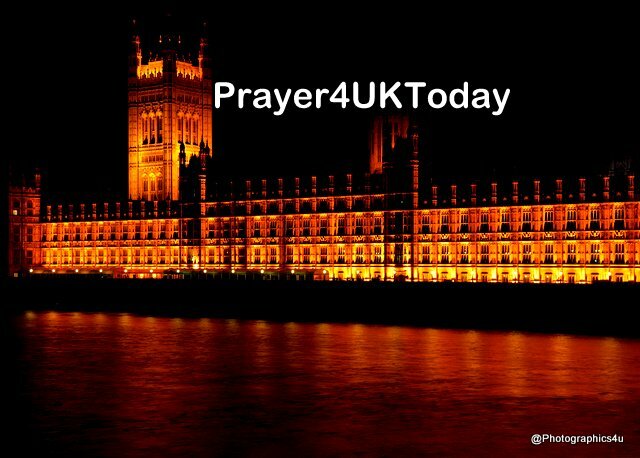 Send an email to Prayer4UKToday@gmail.com with a request to join the list of intercessors. If you want the prayers sent via Whatsapp email us your mobile number. Many thanks for answering the call to be an intercessor.